430 East 110 St. N. Y.
John Jordis, iron founder, was located at 430 East 110th St. approximately 1898 to 1905. The proprietor, John Jordis (1860-1942? ), applied for a passport in 1921, in which he declared that he was born 25 November 1860 in Essen, Germany, that he emigrated to the U. S. in March, 1882, and that he became a naturalized citizen 17 October 1887. During the later years of John Jordis Iron Works, John Jordis's son, Henry J. Jordis (1891-1932), was also an officer in the company. This ad for John Jordis appeared in the Real Estate Record and Builders' Guide, October, 1899. This ad for John Jordis appeared in the Building Trades Employers' Association Bulletin, March, 1905. 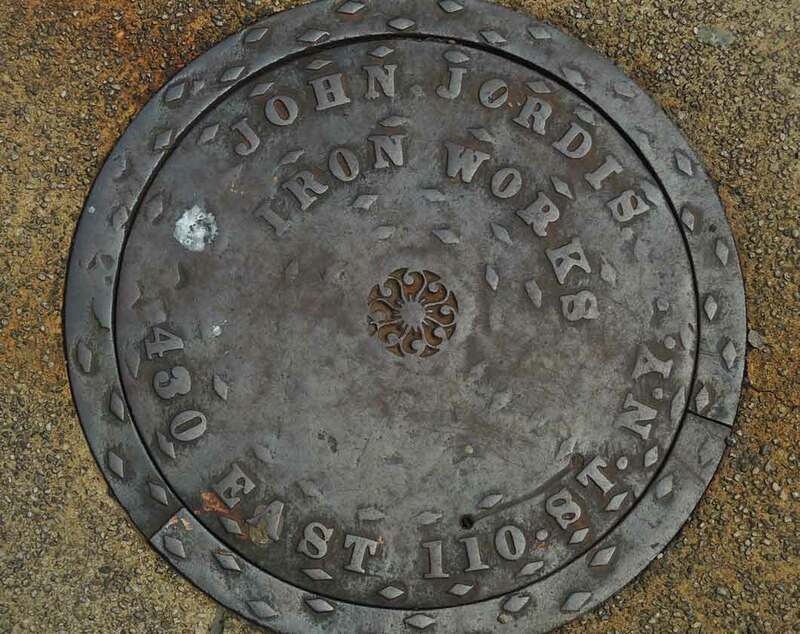 Briefly (around 1898) John Jordis Iron Works was known as Jordis & Holl, Jordis's partner being John Holl (1865-?). John Holl's passport application in 1906 declared that he was born 18 April 1865 in Württemberg, Germany, that he emigrated sailing from Antwerp 22 April 1882, and that he became a naturalized citizen 17 October 1887. Jordis and Holl, then, became citizens the same day. Each witnessed the other's application, and both lived at the time at 1340 Second Avenue, New York City. By 1899 Jordis and Holl had gone separate ways. John Holl Iron Works were located at 402 East 104th Street. This ad for John Holl appeared in the Real Estate Record and Builders' Guide, October, 1899. A few years later John Holl Iron Works moved to 1971 First Avenue at the corner of 101st Street, where they stayed in business until around 1910. This account of Holl Iron Works activities appeared in the Real Estate Record and Builders' Guide, 17 August 1901, "The new 8-story business building Nos. 36 and 38 East 20th st has a highly ornamental store front, which was erected by John Holl, architectural and ornamental iron worker, of Nos. 1971 and 1973 1st av. Mr. Holl furnished all the iron for this building; also for the new Elmhurst apartment house, on the northwest corner of Broadway and 98th st, after plans by Neville & Bagge. Mr. Holl is engaged on the alteration of the Hotel Cecil, corner of St. Nicholas av and 118th st, for architect Wm. B. Franke. Telephone, 2281-79 calls Mr. Holl's office." Also associated with John Holl was his brother, Bernard Holl (1867-?). His naturalization petition was witnessed by John Holl in 1894, when Bernhard Holl said that he was born 24 November 1867, and that he arrived in the U. S. 9 April 1883. Bernard Holl was listed in directories as a builder, B. Holl & Co., from 1909 to 1928.